Last night I roasted a whole butternut squash that has been in the fridge for nearly a month. It was a smallish squash, less than two pounds, but I still had two cups of leftover squash at the end of dinner. As I stared at the remaining, flesh and the two bananas on the counter, I dreamt about breakfast. (Yes, I know, a full tummy and I can still daydream about my next meal.) Would a squash and banana smoothie be tasty? And VideoJug shows how to combine juice, bananas, and squash into a smoothie that kids will drink up. Since I find the squash and banana sufficiently sweet, I omitted the honey and simply combined a banana, a cup of butternut squash, and some almond milk with ground cinnamon, ginger, and nutmeg. I suspect you can add any combination of spices. Any takes on a madras banana and squash smoothie? In my research, I found a few other creative ideas that involve butternut squash. I did not want a pie or soup or gnocchi treat. Two recipes in that search have me thinking of new sauces and veggie ideas that go way beyond the squash. The Oh She Glows blog has a recipe for a butternut squash and vegan cheese sauce to enjoy a satisfying Mac & “Cheese”. And a “Warm squash and arugula salad” from The Kitchn. This one I am planning to try tonight with romaine hearts and some young goat cheese. Oh, and if you are wondering about our zero waste goal: I will eat the whole squash. Seeds can be roasted and the skin is edible. Simply roast your squash whole in the oven with a bit of oil and salt on the skin and you will have a tasty nosh that is 100% edible. I like it almost as much as baked potato skins. This entry was posted in Waste less recipes and tagged Butternut squash, Cook, eating green, ginger, Pumpkin and Squash, recipe, sustainable living, vegan, Waste less recipes by Bonnie Lee. Bookmark the permalink. I am curious and passionate about science and its ability to shed light on the under-explored connections that govern life. I strive to understand how biology, chemistry, physics and mathematics shape the haphazard elegance of our existence and to share those discoveries with any pair of willing eyes and ears. Huh, what a unique combo. I would add the honey as I have honey everyday. I make a lot of smoothies and may just try this one. In fact, I am off to make a strawberry one now! The bananas are so good for my heart. You’d think honey would be needed, but it was sweet like pie as it was. 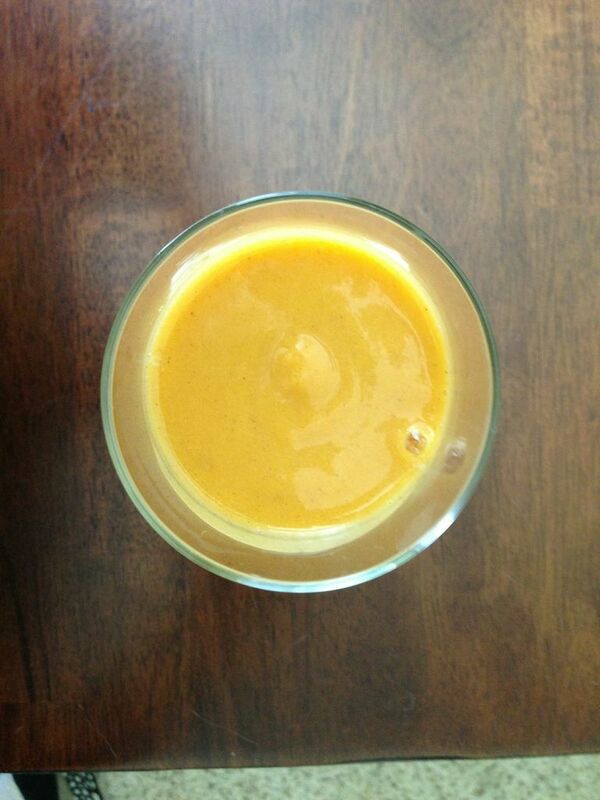 Smoothies are such a great way to save veg and fruits that are no longer aging gracefully. Please let me know how the honey helps. That salad was yummy–I am on a new kick with pan-fried lettuces thanks to that recipe. Another nice post, Bonnie Lee. And I’m so sorry to be away so long. My life is still absolute chaos and keeping me from my beloved blogs (which yours is). I’m always amazed at how many people roast their squashes AFTER removing the skin. Leaving it on does several things: minimizes cutting-your-finger-off scenario by peeling, keeps the squash from sticking to your container when you roast skin-side-down, great fiber for the body, tasty TASTY on the tongue. We have already three pumpkin plants starting, but with the impending heat this summer – coupled with gardener neglect, not being their to watch for squash bugs – they may not do so well. No worries. Will try the smoothie with other hard squash varieties instead! Oh, this smoothie was heavenly. I cannot wait for winter squash season to return to try it again. Do not worry about being away so long, we’ve also had a run in with life. Between trying to understand how I could have a blood pressure of 84 over 42 when I tried to give blood, my annual health check (which came with two vitamin deficiencies I cannot explain D and B12), a quick 4-day business trip Singapore that ended two days before our move, a move and a panel event. I had no time to breathe. I found myself napping in the afternoons all last week. The chaos and fog have only just lifted. And I am cooking again–dandelion, yam, and other greens are at the markets! I do hope you get those under control. Vit D and plant calcium together did much to bring my blood pressure back up when it was low. Turnip greens (and a bikini top) are my saviors. Glad to hear that your life is getting back to normal again. Wish mine was!